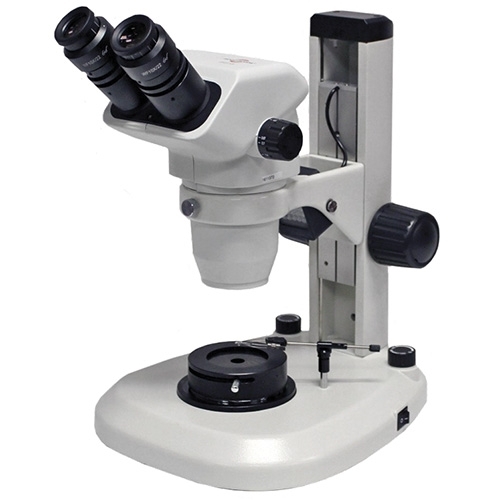 Designed for the discerning gemologist, the 3075-GEM incorporates our most popular zoom stereo microscope delivering excellent flatness and tremendous depth of field via our most advanced Greenough optical system ever. Incorporating the latest ergonomic, optical and mechanical designs, the 3075-GEM Zoom Stereo Microscope delivers unprecedented clarity, detail and accurate color rendition for the examination of diamonds and precious stones. Optical System: Featuring a magnification range of 10X—67.5X with the included WF (Wide-Field) 15X/15mm eyepieces. Illumination: The natural daylight LED illumination system provides darkfield illumination and reflected (top) illumination from above. The adjustable darkfield condenser with iris allows for precise control of light.